Historic eye chart influences typographic design. Although February 19 recently passed without much fanfare, it is in some ways a historic day. That’s the birthday of Herman Snellen. Do you remember those old eye-charts ? You had to cover one eye and stand at some specific distance away form the chart, then say out loud all the letters you could read. Herman Snellen was the inventor of that chart – the Snellen eye chart. What’s interesting is the influence the Snellen chart has had in graphic design. Although his idea was to use typography in a purely mechanical sense (i.e. 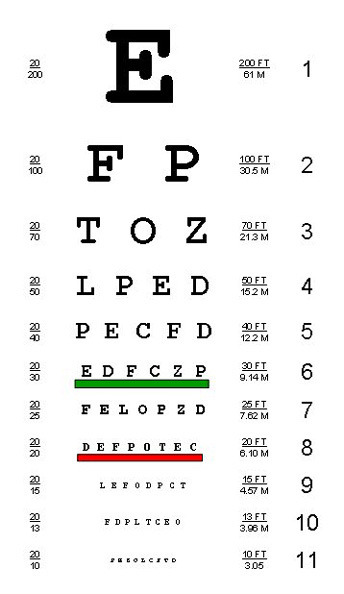 the chart text has no meaning), over the years designers have leveraged the familiarity of the Snellen chart to create a graphic context that conveys meaning through typography. This entry was posted on March 23, 2010, 6:50 am and is filed under Font Related, Interesting. You can follow any responses to this entry through RSS 2.0. You can leave a response, or trackback from your own site.